TV Girl: Christmas TV Episode #3: "The West Wing"
"The West Wing," epic and magnificent as it is, this foray into American politics and the nuts and bolts of democracy, is really, at its core, a treatise on personal histories, friendship, and (excuse my language) the politics of the heart. Noël is a study in this hypothesis, an episode of "The West Wing" that deals primarily with the personal dilemmas of its characters and secondarily with the political, press-related, and national security dilemmas of the White House. Like "Studio 60 on the Sunset Strip," "The West Wing" is a show about a workplace, but also like "Studio 60," on "The West Wing," workplace-related ordeals are not separate from the ordeals and agendas of its characters. Often, the two are directly related, either literally or symbolically. The affairs of the White House affect and are affected by the characters that handle them, and no character is ever lost at the expense of political wonk or consternations of national security. There is a fair bit of shop talk in "The West Wing," but it's well-written, and you don't necessarily have to understand it all to know what's going on, or to have a good concept of the gravity of the circumstances. Sorkin is a genius in writing mood and frustration. He gives his characters things to talk and rant about, and then they run around and talk and rant in their own fabulously unique ways. It's all about the characters. They're credible and dynamic, and we'll follow them pretty much wherever they want to go, regardless of whether we know what they're talking about while they get there. In Noël, we see Josh Lyman (the role that Bradley Whitford was born to play), Deputy White House Chief of Staff, meeting with an ATVA psychologist Dr. Stanley Keyworth (guest star Adam Arkin) to discuss and come to terms with his recent symptoms of Post Traumatic Stress Disorder. Josh's PTSD is a result of the Rosslyn, VA shooting at the end of the first season, during which two gunmen fired shots into a crowd of Bartlett Administration players on their way out of a town hall meeting. Josh and President Bartlett were shot, and Josh's injury was critical. Noël is masterful in its examination of sound: music, especially. The introduction of the brass quintet, and then the bagpipes, and finally the cello, played in a special appearance by Yo-Yo Ma, build and evolve throughout the episode, and are eventually transposed over the sound of sirens. The transposition illustrates Josh's constant reliving of the shooting at Rosslyn, and how, in his perception, the music equals sirens, a perception that is triggered by the PTSD and causing him to have a meltdown. This meltdown culminates about five days prior to the outer story, when, after the Congressional Christmas Party and the performance by Yo-Yo Ma, Josh goes home and injures his hand by cutting it on some glass. The hand injury, and how Josh received the injury, is sort of the crux of this episode, so I won't give away too much information here. Josh claims to have hurt it by setting down a high ball glass too hard on an end table, but it's clear from the get-go that this is a fabrication of his broken mind. It's also clear that getting Josh to recount what really happened to his hand is Stanley's goal in getting Josh to acknowledge his PTSD. The hand injury and Stanley's frequent repetition of the question "How did you hurt your hand?" is, essentially, the driving catalyst behind all the in-scene exposition of Noël. The outer story of this episode is simple: Josh sits and talks with Dr. Stanley Keyworth, ATVA psychologist, for several hours on Christmas Eve. The majority of this episode is conducted through exposition, flashbacks that begin about three weeks before the outer story and end with Josh injuring his hand after the Congressional Christmas Party five days ago. This episode uses flashback in various ways, particularly snap flashbacks full of aural and visual parallels to the outer story, and repetition of these snap flashbacks to create a visual tension for Josh's fractured memory. (Note: I'm using the term "snap flashback" because I don't know what else to call it. What I mean is a very quick flashback, almost impressionistic.) In particular, the repetition of a snap flashback in which Josh does set down a high ball glass too hard on the table (while it's clear that this is not what actually happened) really nails the idea of repression, and how capable the human mind is of altering memories that are painful. Here's that Sorkin social consciousness again. In Noël, he acknowledges the true nature of PTSD, that it is not simply a stigma applied to Vietnam and other war Veterans, but a serious psychological condition that can affect anyone who's been involved in a traumatic situation--even the Deputy White House Chief of Staff. Whitford's performance in Noël will shake and startle you. 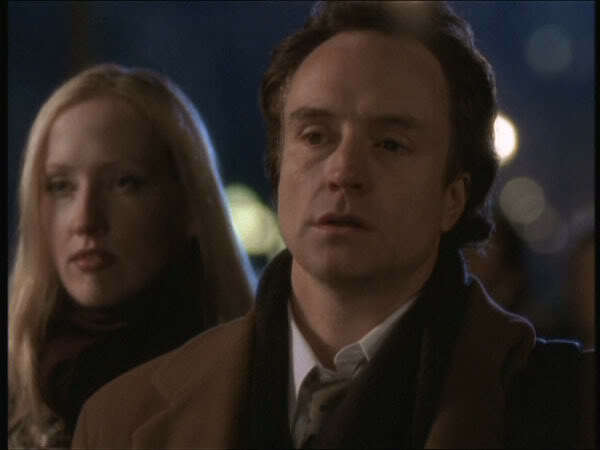 It's so controlled, yet unexpected, because the Josh Lyman character is very much about confidence, snark, and arrogant charm (not to mention intellectual superiority). To see him stripped of his composure, of his control and then shucked down to sheer fear and frustration, a pulp of his former self, is unnerving. His fragility is so intimate that, at times, it's almost uncomfortable to watch. But then again, this type of intimacy seems to be Sorkin's best and most unacknowledged specialty. So it works, and we watch. I think the best part of this episode is in the above clip, when, after Stanley finally dispenses Josh into the world, diagnosis in hand, and Leo McGarry is waiting for him in the White House lobby. Josh is surprised, and then Leo tells him a story about a man who falls into a hole, and here, in this scene, is what I'm talking about when I talk about politics of the heart. "As long as I got a job," Leo tells Josh, "You got a job." Like I said in my post about "Studio 60," Aaron Sorkin has this uncanny ability to encapsulate moments and themes that, in the hands of a lesser writer, would almost always reveal as sentimental and schmultzy, and to master them into these moments of pure understatement while still imbuing them with quite a bit of emotional gravity. This moment at the end with Leo is a perfect example of what I'm talking about. I think it really is just a matter of remembering the agenda of each character and not allowing message or sentimentality or formula to get in the way of credible characters and character interactions. I mean, it's not easy, but Sorkin does it anyway. This idea of character agenda is, I think, a huge part of what's making TV so good these days. You see, television that sticks to formula, like "CSI" or "Bones," must often use its characters as pawns to sort of serve the story, to push the plot forward, mouth pieces for expository information. This doesn't leave much room for credible characterization and agenda. Great TV is really only characters and agenda. Like "Friday Night Lights" and "Mad Men" and, yeah, "The West Wing." What's the "plot" of a show like "The West Wing?" Well, there's a premise. There's always premise, but the "plot," or whatever you want to call it, is really, then, just the result of several different characters sort of bumping into and reacting to each other in a certain setting at a certain time. Sorkin is, I think, the true master of the television character. That's why he's on this list (and lots of other much more important lists) more than once. UP NEXT: Getting down to the final two! For this next one, think the 90s and a young Matthew Fox. What the West Wing is successful in creating is, you're right, the fallibility of the characters that run our most political office. Josh's brush with death at his job is so unusual for people. Josh's brush with death at his "office" job is also unusual. There is another episode that addresses this. When Josh as Deputy White House Chief Of Staff is giving his special evacuation plan and clearance as a matter of national security. He asks the people he works with everyday (cj, toby, sam) something like "isn't this weird?" and they are oblivious. Josh then feels weird that his life is more valuable to the Secret Service than that of his colleagues. This show does a great job of subtly bringing into the "workplace" the gravity of the responsibilities and danger of working that high up in government. It would be ludicrous if Pam and Jim got shot at by a rival paper company.